Published: January 22, 2017 • Modified: October 23, 2018 • by Author: Analida • Word count:759 words. • About 4 minutes to read this article. While visiting Hanoi I was introduced to bun cha: Vietnamese Pork Meatballs. It was a life changing experience. Really, it was. This past Christmas my family and I took a trip to Vietnam. My daughter is an English teacher there. On one of our first days she booked us a street food tour with Thanh. Thanh introduced us to many local Vietnamese delights, among them bun cha: Vietnamese pork meatballs. The word bun means rice noodles, and cha means grilled pork. On one of our street food stops, Thanh led us through an alley and up a set up of steep wooden steps. We ended up in a crowded, rectangular room with a balcony at one end. The room was full of picnic-like tables, packed shoulder to shoulder with locals. Everyone hunched over their bun cha bowls eating with gusto. This must be good I thought! We weren’t the only westerners in the room, but almost. I took my first bite of bun cha and fell in love. The combination of flavors is absolutely amazing. In Hanoi, many local eateries are small, unassuming, and specialize in one or two traditional dishes only. Throughout our stay we found this out time and time again. 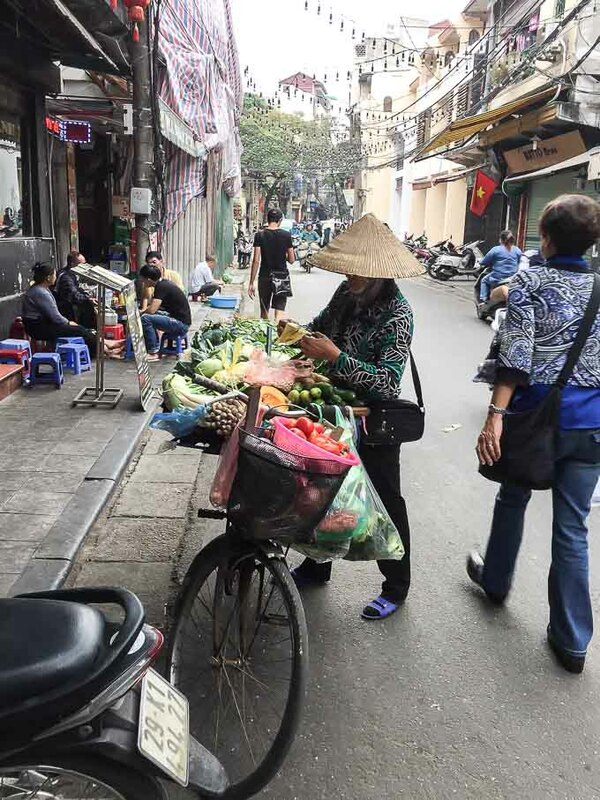 If you are ever in Hanoi, and consider yourself an adventurous eater, book a tour with Thanh. So, what is bun cha exactly? 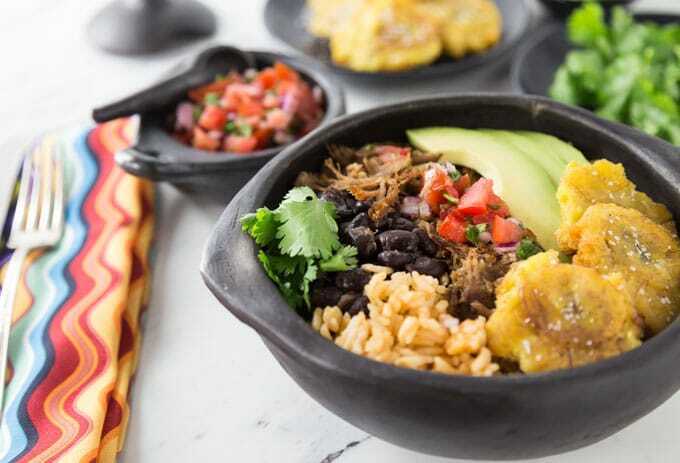 Well, for me, it is heaven in a bowl! Okay, I’ ll be more specific. 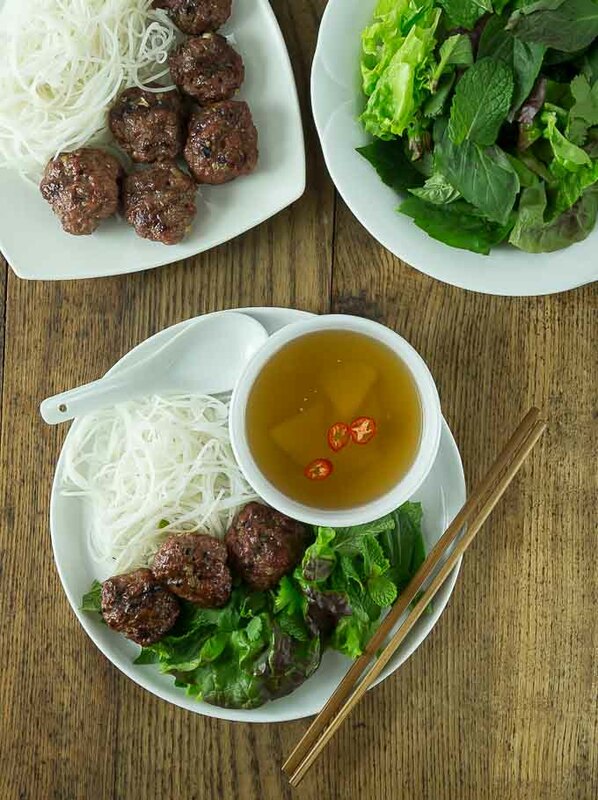 Bun cha is a traditional Vietnamese dish of grilled pork meatballs slightly flattened to form patties. If you don’t have a grill, or are in the middle of a northern winter, no worries. You can cook the patties on a skillet and then broil them. 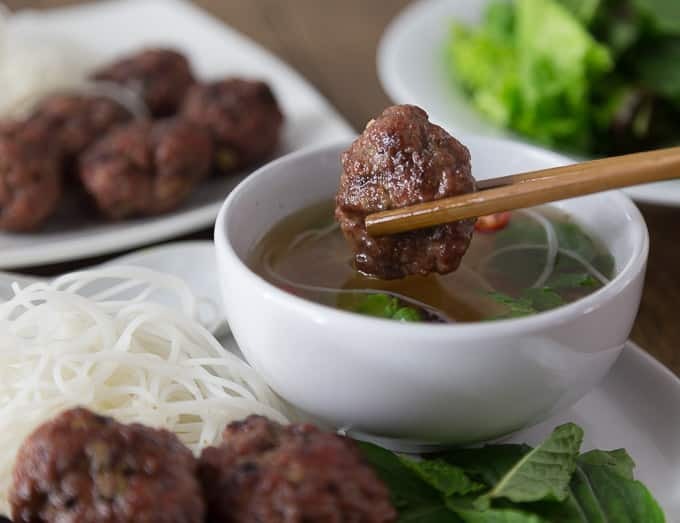 Vietnamese pork meatballs are served with a delicious golden broth, a variety of fresh herbs, greens, and rice noodles. After returning home I messaged Thanh for instructions on how to make bun cha. She gave me a brief explanation, so I decided to give it a go. There were a few FB messages going across time zones. I asked questions about proportions, ingredients, etc, just so you know. It was like having my personal culinary consultant. I think my recipe turned out pretty close to that little upstairs restaurant. Unfortunately Thanh is not here to be my critic, but it does help that my husband and son thought the flavor profile was spot on! 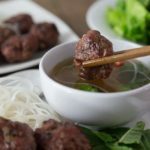 Last but not least, enjoy this recipe for bun cha: Vietnamese pork meatballs, and share with your friends too! You don’t have to go to Vietnam to enjoy great Vietnamese food. If you want to check out some authentic Vietnamese recipes I have some more to share that you can easily make in your home. 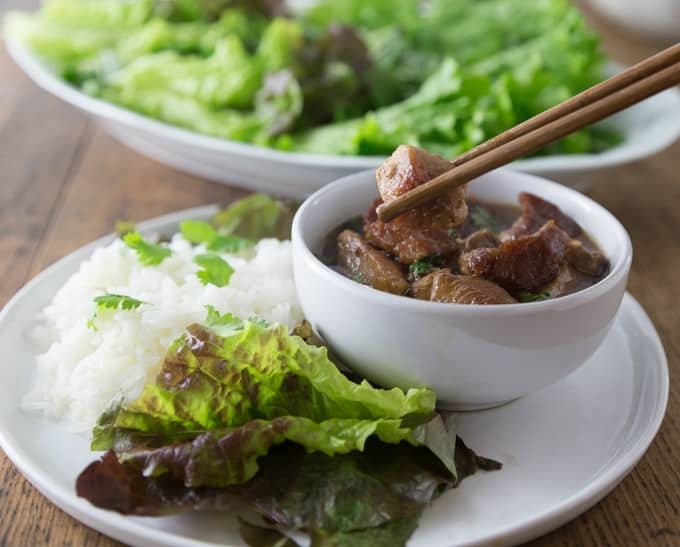 Vietnamese coconut braised pork (Thit Kho Tau) is slow cooked, tender, salty and sweet is one dish you have to try! During the hot summer months a nice cool Vietnamese Beef Noodle Salad: Pho Tron is very popular. 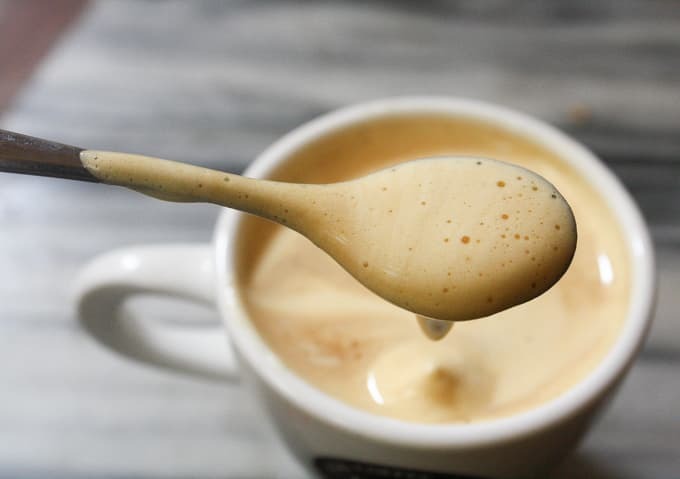 You have to finish off your meal with a traditional Vietnamese Egg Coffee or ca phe trung (cà phê trứng) is a Hanoi espresso with a sweet meringue like topping. 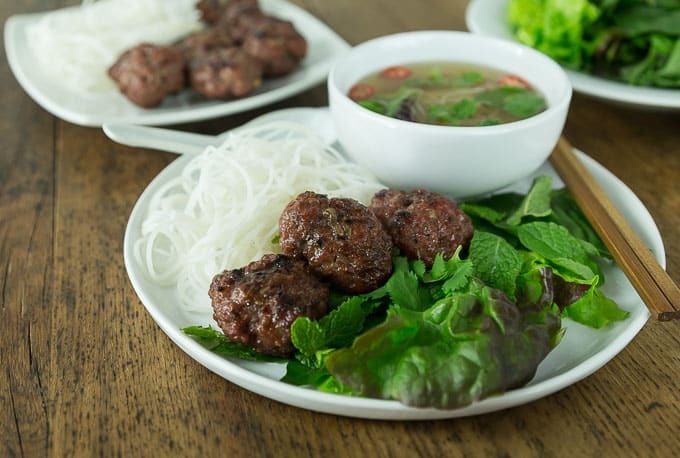 Bun cha is a traditional Vietnamese dish of grilled pork meatballs served with a delicious golden broth, a variety of fresh herbs, greens, and rice noodles. Arrange all the greens on a tray. In a bowl place ground pork, five spice powder, salt, fish sauce, shallots, garlic, and pepper. Marinate for about one hour, and then form small, 1" meatballs. Flatten them out to form a patty. While the pork is marinating, slice the kohlrabi thinly, and place in a shallow glass dish. Each slice of kohlrabi should be cut into 3 wedge shaped pieces. Sprinkle with kosher salt and vinegar, and allow it to sit for about 1 hour. Cook meatballs/patties in a skillet, on both sides. When finished, transfer them to a baking tray and place them in the oven on broil for about two minutes on each side. Prepare the broth by placing fish sauce, water, lime juice, brown sugar and rice vinegar in a small sauce pan. Bring to a boil, and remove from heat. Divide the broth evenly into 4 separate bowls. You are welcome, I am so glad you liked it. So so yummy. I was lucky to try them on the street first. Then the mystery was unlocked when you posted the recipe to this irresistible dish. Thanks! Thanks Erika for your kind comment. I am glad you found my post interesting and that it unlocked the “mystery” of bun cha. Hi Thuy, when I was in Vietnam last year I tried bun cha, and the greens that were served with it had mint. Maybe they do it different in different regions of your country? Hi Mike! Thanks for the 5 stars. I am glad also that you found the recipe. I’ve never made Pho; it’s on my to do list. Did you make your own bone broth? You are right, noodles are in every dish. I can’t wait to go back to Vietnam. it’s such a beautiful country. My daughter lives there; she works for a marketing firm. A couple of queries on the recipe. I’m in Australia so I had a little fun translating some of the terms into local ingredients. I am also just learning Vietnamese cooking so having fun sorting out some of the preparation techniques. 1. The kohlrabi – WHat is the purpose of salting it and sprinkling it with vinegar? 2. What do you do with it afterward? it is mentioned as an ingredient for the soup, but after slicing and marinating, it is not mentioned again. I was not sure if I should rinse it, and add to the soup or what to do with it. 3. Can the pork balls be baked in the oven? if so what temperature and how long? 4. The recipe says 2 shallots minced, 1 garlic clove minced. What process do you use to mince these items? I have yet to purchase a Garlic Press (on the list) but that would not be suitable for Shallots anyway. Request advice. Let me try to answer your questions as best as possible. Salting the kohlrabi and sprinkling it with vinegar helps to soften it. My daughter’s Vietnamese friend told me about this. Afterwards, you put the kohlrabi in the broth. If i did not mention this, I apologize for the oversight. You can do the pork balls in the oven,, although I have never done it. I would suggest baking them at 400’F (204’C) for about 15-20 minutes. Finally, to mince shallots or garlic, I just use a well-sharpened chef’s knife. You can certainly use a garlic press for the garlic instead of mincing, if you prefer. My family loved this dish, even my picky eaters wolf them down. I was wondering if you can freeze the meatballs after they’re pan fried. I am so happy to hear that Cat. Yes, you can freeze the meatballs one you pan fry them. I would not freeze them too long though. Msybe three of four days.